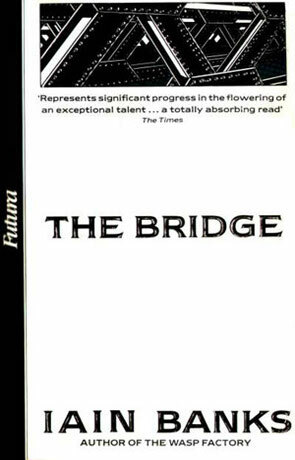 The Bridge is a novel by the award winning British author Iain M Banks. I'm ever in awe over Banks - where The Wasp Factory was a really strong debut novel, The Bridge as his third published novel is just so much more. It's fantastic to see him develop as a writer and storyteller - Yeah, I know I should have read Walking On Glass first, but I don't have it, so I can't. Anyway, Banks has moved from one simple story line (Wasp Factory) to several not-that-simple narratives, in just a few books and with The Bridge he proves that he masters this, as naturally as a fish does water. Luckily he knows when to stop and a quick look through his published works to date, show that just about half his novels are single narrative and the rest multiple narratives. There's nothing worse than somebody who discovers a new clever tool and then uses it excessively. Enough with the usual Banks praise, you say? How about the book you say? Okay, The Bridge is about a man who has been in a car crash, on a bridge and goes into a coma and comes out on ... The Bridge. In the beginning he doesn't know that the bridge is in his mind only and he thinks himself an amnesia case, as he can't remember anything from before the bridge (solipsism in action, baby!). The bridge, as far as he knows, never ends, it goes on for as long as he can see in both directions and nobody he asks knows any different. The society of the bridge is a strange mix of feudal caste systems and rulling by bureaucracy (probably inspired by Kafka, but I can't be sure as I haven't read any Kafka), if you can imagine such a thing. Lots of strange things going on, most of them just now making sense to me in the light of what happens later in the book. One final note; besides the small, but obvious, link to the culture (before any culture novels have been published! ), it also struck me that the society of the bridge is just about as anti-The Culture as a society can be. Besides being the background for our leading character, it is also a study in what a society with very limited space and resources can be like (as opposed to The Culture with endless space and resources). Written on 1st October 2000 by TC.